Shouldn't everyone have access to clean water? 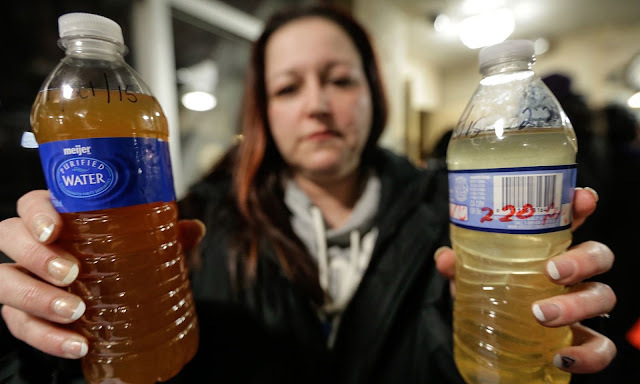 In Flint, Michigan, people don't, and are in dire straits as a result. The Flint Water Crisis has been taking place for two years, but only now has it gotten any attention. In 2014, Flint switched its water supply from Detroit to the Flint River. Immediately, people began to notice a difference. The water smelled and tasted awful, and people began to develop rashes, lose hair, and become very sick. Flint officials continued to assure residents that the water was safe to drink. However, in 2015, lead was found in the water in multiple Flint residents’ homes and a state of emergency was declared. The people of Flint were getting lead poisoning. President Obama has ordered $5 million of federal aid, and various agencies are working to provide people with clean water and water filters. Unfortunately, severe damage has already been done. The children: Children are the most vulnerable to lead poisoning, especially children under 6. It can cause various health issues, from developmental delays to hearing loss. Undocumented immigrants: Flint’s population is largely minority, and out of this, there are about 1,000 undocumented immigrants. Unfortunately, these immigrants cannot get the clean water they need from the water distribution centers because they cannot produce the identification necessary to receive this water. Fortunately, churches such as St. Mary’s Catholic Church and Mission of Hope have been giving out water to immigrants, homeless people, and low-income residents. Donate: There are groups and people who are providing Flint with clean water, and the United Way of Genesee County has created the Flint Water Fund to buy filters and bottled water. You can also donate to the Flint Water Study, a group who is testing Flint’s water and making sure residents know if their water is safe to drink. Sign: A petition was created to call on Flint’s Governor Snyder to stop charging Flint residents for their water bills. It currently has over 8,000 supporters, and it needs more! The petitions description also has more links and places to contact and donate to. The water crisis in Flint is a serious problem. Lead poisoning is dangerous and often deadly, and the people of Flint, Michigan need any help they can get. Please, if you can, consider donating to one of the organizations above, or if you can't, sign the petition, because every little bit helps.